Puppies! Who doesn’t love ’em? They’re cute, cuddly, and silly. They look like little angels when they sleep, which is often. When they’re awake, they spend all their time exploring and learning about the world around them. We marvel at their curiosity and playfulness – until we experience The Teeth. The short answer is: You don’t! 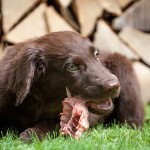 Smart owners do everything they can to help their puppies develop “bite inhibition” over time. However, this doesn’t mean you allow your puppy to puncture and hurt you! There are a number of things you can do to manage a nippy puppy until your puppy outgrows this important developmental stage. 1. Get lots of chew toys. Seriously, lots of them. 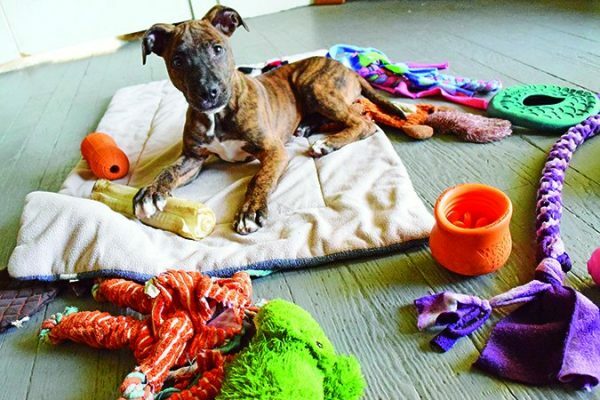 Don’t skimp on the number or variety of chew toys your puppy has access to. Owners are often advised to keep only one or two toys out at a time (and to rotate them) so that their dogs don’t become bored, but this does not apply to puppies! Further, when your puppy does pick up a toy, take advantage of the moment to reinforce this good behavior by showering him with attention. Think about it – if you ignore him when he picks up the correct item, but shout and jump around when he grabs your toes (or shoes), he’ll quickly learn that biting toes (or shoes!) is a sure way to get your attention. Showing him that picking up a toy, instead, is indeed the best way to get your attention will pay off in the long run. 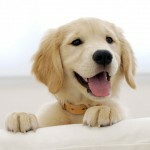 Keep a “latch rope” in any room the puppy has access to, so there is always one close at hand to offer the puppy. Better that he grab the rope than your pants leg, skirt hem, or tender flesh! This doesn’t have to be anything special; the term describes any long item that can be dragged behind you as you move through your home. Moving objects are an open invitation for puppies to latch on with their teeth. Feet, pant legs, bath robe hems – they’re all fair game! I suggest to clients that they make several of their own “latch ropes” and keep them handy, all over the house. That way, when they walk from the living room to the kitchen, they can grab the closest latch rope and drag it behind them as they move. Puppy is more likely to latch onto that than to moving human feet. This is especially useful for kids who may feel terrorized by their new friend each time they walk or run through the house. You don’t need to buy a bunch of these toys; they are easy and inexpensive to make. You can cut an old beach towel or large bath towel in half (lengthways) to make two separate toys. Tie a knot in the center, then two smaller knots on each end. Or, ask your friends and family members to donate their old pairs of jeans. 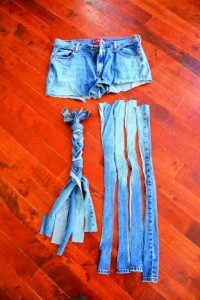 Cut the pant legs off, and then cut each pant leg into several long strips of fabric that you can then braid to make a denim rope. All of these homemade toys can easily be tossed into the washer when needed. 3. 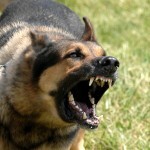 Redirect your pup to a “legal” object to bite. Simply petting your puppy can sometimes prove difficult. He may view your hands on him as an invitation to play – and that means using his teeth! Scrambling to save your fingers from a chomping puppy mouth can look like the legendary Buster Keaton “sticky fingers” comedy routine – as soon as you free one hand, the puppy has latched on to the other! Try holding a chew toy for your puppy to gnaw on while your other hand gently strokes him. When done correctly, this is an excellent bonding experience. You can make several latch ropes from a single pair of torn or worn-out jeans. Cut the legs off, cut the legs into strips, then braid and knot the ends. 4. Toss his treats on the floor. Delivering a treat to a bitey puppy during training requires some skill. 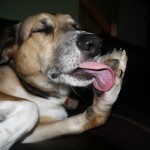 Avoid pinching the treat between your thumb and index finger, or your puppy’s teeth may clamp down on your fingers. Instead, offer the treat in the palm of your open hand, or, better yet, toss it to the floor. There’s an extra advantage to tossing treats directly on the floor: Your puppy will learn to anticipate that good stuff is delivered on the ground, and not necessarily from the hand. This will help curb his interest in human hands, and will result in less jumping up to bite them. It is especially helpful in keeping children’s tiny hands safe. Shouting once or twice might work by startling your puppy at first, but soon he’ll learn to ignore it. Sometimes, shouting or shrieking can actually cause the puppy to become more excited. It’s perfectly normal for us to involuntarily respond to a sharp puppy bite by letting out a few choice words, but it is certainly not an effective training plan. Instead, quickly refer to one of the suggestions above. By far the best plan of action for dealing with puppy biting involves being well-prepared. Manage your puppy’s environment by storing anything you don’t want him to chew, including plants, wires, and anything else within his reach. 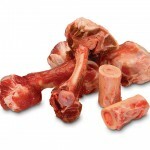 Have lots and lots of appropriate objects available for your puppy to wrap his teeth around, and remember to praise him every time he puts the right item in his mouth. Be patient; this shall pass! Nancy Tucker, CPDT-KA, is a full-time trainer, behavior consultant, and seminar presenter in Quebec, Canada. Is Convenience Killing Your Pet?